Can Giants rebound from tough loss? Yes! 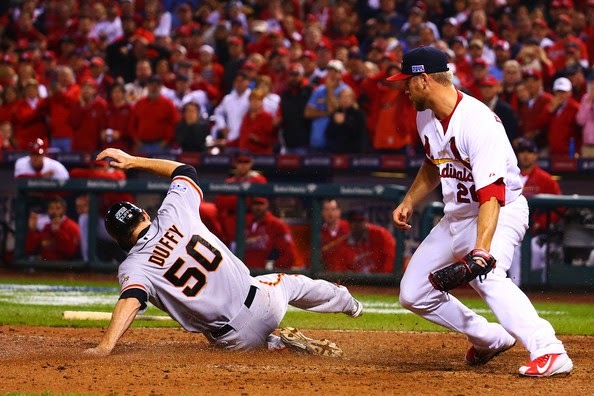 The San Francisco Giants lost Game 2 of the NLCS 5-4 to the St. Louis Cardinals on Sunday night. It was an epic, heart-stopping, roller coaster of a ride that ended with a thud for Giants fans. All of the decisions made by Bruce Bochy have been covered locally and nationally by the writers. We've all heard about the Cards and their amazing home runs after ranking last in the NL. The narrative of a "gritty" Giants team owning October baseball has been written, and rewritten again. So what happens now? Where does the 2014 NLCS turn as it heads to San Francisco for 3 games at AT&T Park? For starters, the strained left oblique of Yadier Molina is a huge blow to the Cardinals. Before the NLCS started John Shea of The San Francisco Chronicle wrote about how Molina and Buster Posey are the backbones of their respective teams. These quotes from Cardinals third baseman Matt Carpenter jumped out at me. I’m sure everybody in the room would feel their role is irreplaceable, but he might be the one guy that truly hits home with. You lose him, the whole dynamic of this team changes. His importance is huge. He’s our leader. It appears that Molina is not being shut down for the remainder of the series. During today's workout Cardinals manager Mike Matheny said that he thinks Molina can still contribute. I get what he's trying to say, but if Molina can't swing a bat then what help can he really be? Matheny was optimistic he could use Molina behind the plate for late-inning defense as soon as tomorrow. Swinging a bat is not possible for Molina right now, Matheny said. It's not just the bat. Molina guides the Cardinals pitching staff as an extension of Matheny. I don't think Tony Cruz or (gasp!) A.J, Pierzynski is going to be able to fill that role. Managing the bullpen is tough as it is, not having Molina to guide them is going to make it tougher on the Cards. It's unfortunate for the game that Yadier Molina got hurt, but the Giants need to take advantage while they can. Now Molina being hurt may not swing an entire series. There's still plenty that needs to be done by the Giants to advance. There are too many wasted opportunities being left on the bases by the Giants. Through 2 games the Giants are 5-for-20 (.250) with runners in scoring position. It looks a lot better than it is because the Giants are not getting any extra base hits to drive in runs. They have stranded 19 runners on the bases through the first 2 games. Generally the Giants are a station to station baseball team. If no one is driving the ball, they are limited to singles. Because of this, the bases get clogged up and the Giants end up stranding the runners. A home run, or even a double, would go a long way towards igniting the Giants offense. Compare that to the Cards who are only 1-for-8 with RISP with 11 runners left on base so far in the NLCS. Four of the 5 runs scored by the Cards have been via the solo home run. The bullpen has limited the damage, but there's work to be done. That leads me right in to the last adjustment that really needs to be made by the Giants. FOR THE LOVE OF EVERYTHING THAT IS GOOD ON THIS EARTH DO NOT LET HUNTER STRICKLAND FACE ANOTHER LEFTY!!!!! Bruce Bochy needs to make some adjustments with the bullpen. Losing Sunday night's game in the manner they did will cause the Giants staff to reevaluate how certain relievers are used. The point about Strickland is driven home. Big league hitters can hit fastballs and he's not fooling anybody. The best bet is to use Strickland for 1 batter when a strikeout is absolutely needed. Against a righty of course. I had no problem with Bochy's use of Jeremy Affeldt for 2 innings, I thought that was one of his best moves this weekend as Affeldt shut down the Cards. It was his use of Javier Lopez and Jean Machi that was concerning. Lopez warmed up multiple times, only to be brought in after a lefty had homered off Machi. I think Bochy got caught trying to squeeze a little too much out of his guys. It's as if all of the bullpen took their lumps in one game and now can move past it. That was the first time since Game 2 of the 2010 NLDS that the Giants bullpen blew a postseason game. That's astonishing, and a testament to 2 world championships. Now it's time for Bochy to move the pieces around for maximum strength. I will note here quickly that I was also on board with Sergio Romo pitching the 9th. He has been better than expected over the last month or so. Romo finished the season giving up just 2 runs over his last 19.1 innings pitched. Entering Sunday night's fatal 9th inning Romo had gone his last 11 postseason outings without allowing a run. So will the Giants make the proper adjustments they need and win the series? I say yes. I'm standing by my prediction of the Giants winning in 6 games from my NLCS preview. For once the Giants have managed to handle a streak of bad games at the plate and still come out with some victories. If we suddenly see the offense that appears during hot streaks, the Giants are going to be a tough team to stop. I joined the guys over at TortureCast again to talk about the frst 2 games of the NLCS. It was a full house and I found out I'm not the only one that's confident in this team. Click the link and have a listen. Good stuff Eric. Crazy game last night, and a bummer to lose on a walk-off. But getting a split on the road is still a very good thing at this point. Having the chance to win this series at home now has to be a great incentive for this team. Pablo and Pence looked a lot better at the plate last night, although I have no idea why Pablo swung at Rosenthal's 2-0 pitch that was WAY up and outside in the 9th! I think we are all seeing just how important it was to have Mijares in the bullpen during the 2012 playoff run. Only having 2 lefties, against a lineup like St Louis runs out, is turning out to be a huge issue. But, I still have to ask, when did all of these bullpen righties start failing so miserably against lefty batters?! That needs to be cleaned up in a hurry. Vogey and Huddy... the series now rests on your shoulders. Give it hell!